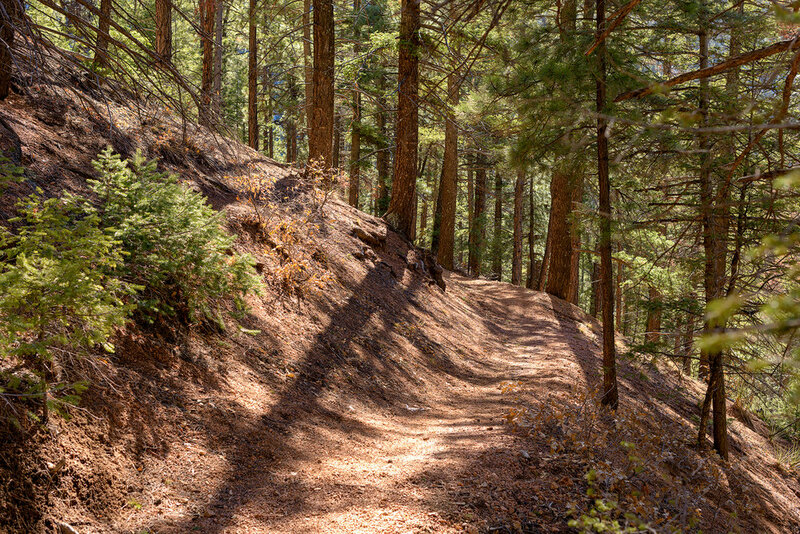 Most hiking trails have a common starting point (usually a parking lot), and then take you off into the forest from there. Columbine Trail has three different starting points, and each has its own unique qualities. I wanted to shake thing up a bit, and start from the end, and work my way down. 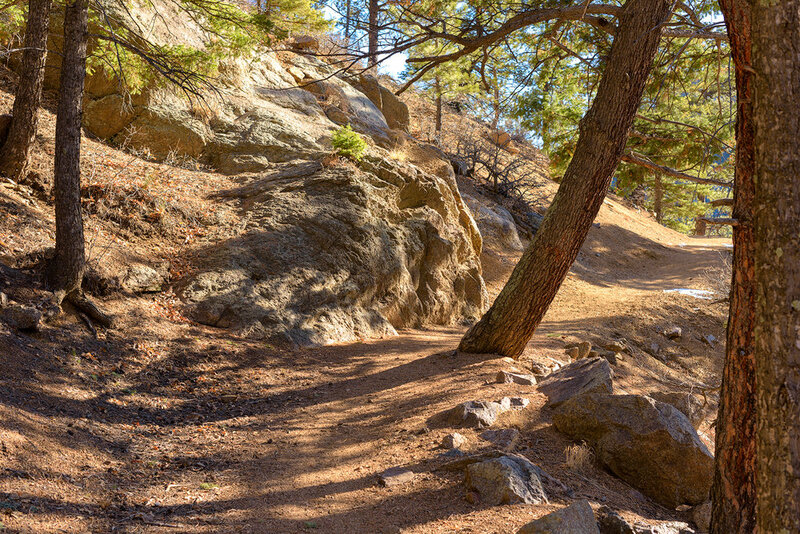 From the parking area near Helen Hunt Falls, the trail does have a bit of a climb, with a quick switchback, before the granite-gravel path begins to level off. 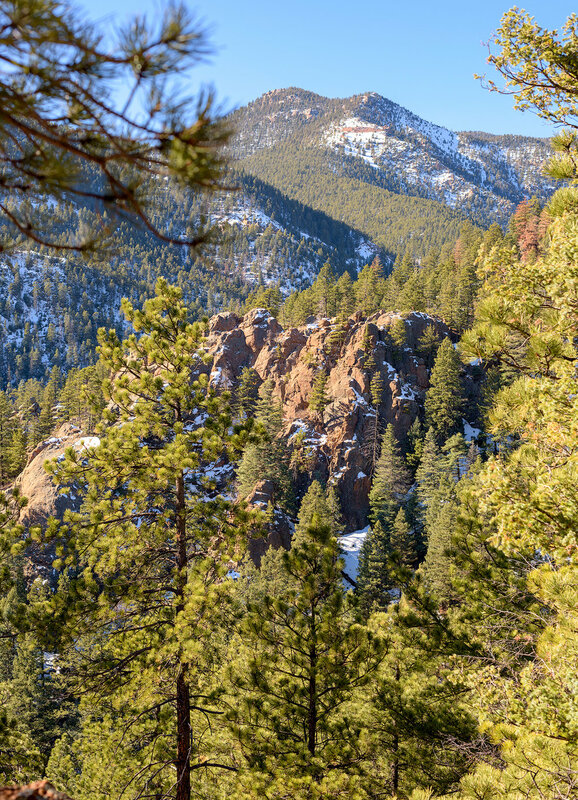 Keep looking west as you hike along for an amazing view of the steep rock face above Helen Hunt Falls. About a half mile into the hike, looking east, the canyon extends below. 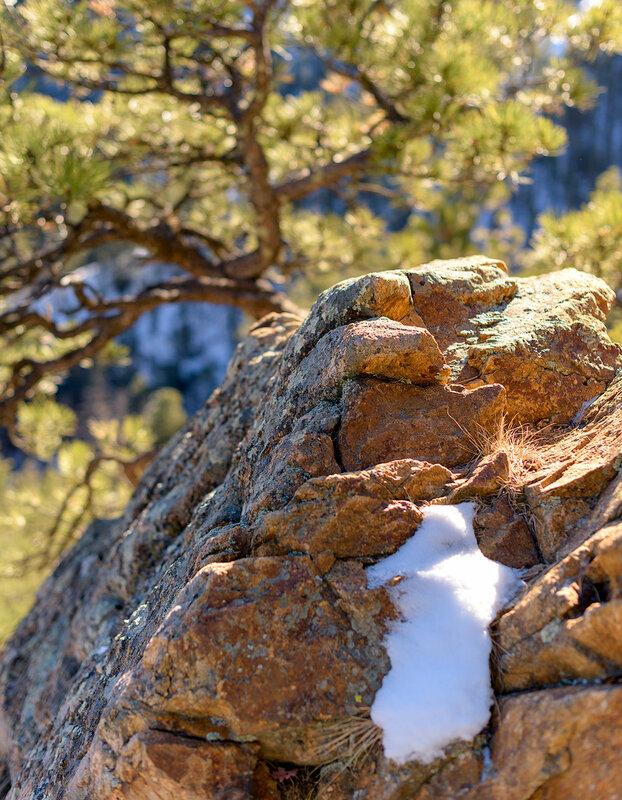 Framed with jutting rock formations, and opening to views of the Broadmoor, and city views of Colorado Springs, this is one of the best "Kodak Moments". Are We Still Hiking Down? From this high point, the elevation change starts to happen more quickly. Enjoy the downhill parts, because there’ll be plenty of uphill to come. The path continues deeper into the shady forest, and closer to Gold Camp Road, before climbing out again. More views open up to the south and west as you continue to make your way down into the canyon below. 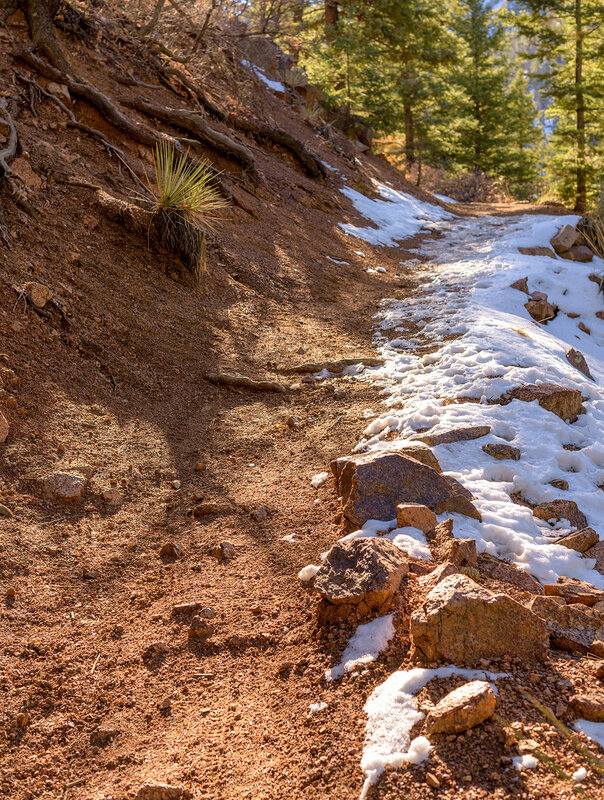 After several switchbacks, and more up and down, the trail makes its last big drop all the way to the Spring Creek Trail Junction. I’m not sure if there is an established start/end to Upper Columbine Trail (where it turns into Middle Columbine Trail) but I always use this junction as my marker. If the wind is blowing just right, you’ll probably hear bells tolling. No you're not crazy, or imagining things. 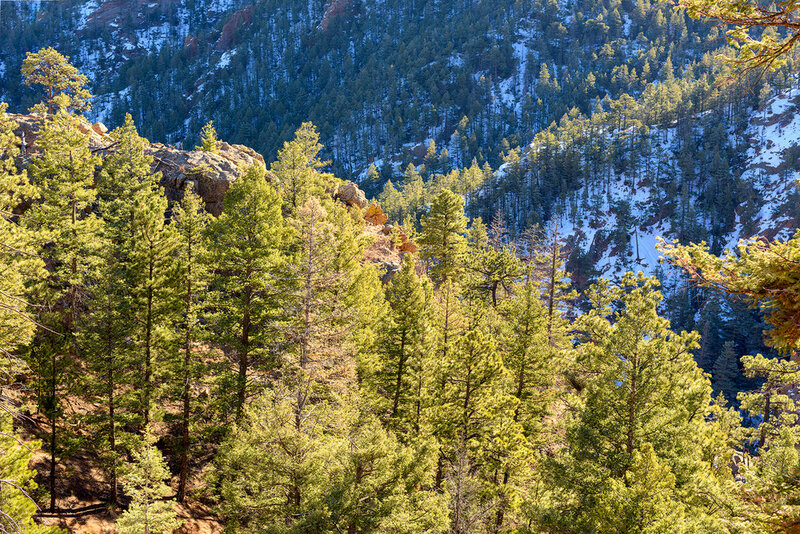 Near the Spring Creek Trail junction, be sure to look for the Will Rogers Shrine to the Sun, which has been serenading Colorado Springs since 1937. Now, it’s time to turn around, and tackle all those elevation changes again...which will mostly be uphill climbing. While hiking Upper Columbine Trail in reverse does delay all the hard climbing until the end, it does give you the chance to see some of the best views in the canyon all over again…and a good workout.